Earlier this year, King Tut’s famous burial mask was damaged during a botched cleaning attempt. Experts are now contemplating the best way to restore the ancient relic. 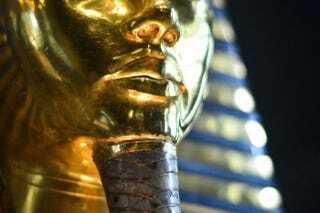 Back in January, the Egyptian Museum admitted that members of its staff accidentally knocked off the mask’s blue and gold beard while trying to change the display’s light bulbs. Freaked out, they quickly glued it back on with epoxy resin, damaging it even further. Which was unfortunate because this glue is an apparently “irreversible material,” and the gap between the face and the beard now features a sickly layer of transparent yellow. [Egyptian antiquities minister Mamdouh] Eldamaty held a press conference with German conservator Christian Eckmann in January where experts claimed the mask is secure and the damage done in August 2014 is reversible. They carried out tests on the mask to ascertain the substance used in its botched restoration and how to remove it without causing harm. In May, Eldamaty appointed a committee, led by himself, to undertake a comprehensive analysis of the mask and the restoration work it has been subject to since its 1922 discovery in Tutankhamun’s tomb in the Valley of the Kings near Luxor. Eckmann, a metal restoration expert, assisted in the study. The investigation was aided by the use of a CT scanner, and the creation of a gypsum replica of the mask. The committee also tracked the history of conservation efforts applied to the mask over the years. Later this month, a conference will be held in Cairo to outline the best restoration strategy. In addition to fixing the beard, the experts will also have the opportunity to repair the many scratches, dents, and marks inflicted onto the mask since its discovery by Howard Carter in 1922. Encouragingly, the restoration effort—which could cost upwards of $110,000—received a €50,000 (USD$56,000) grant from the German government.